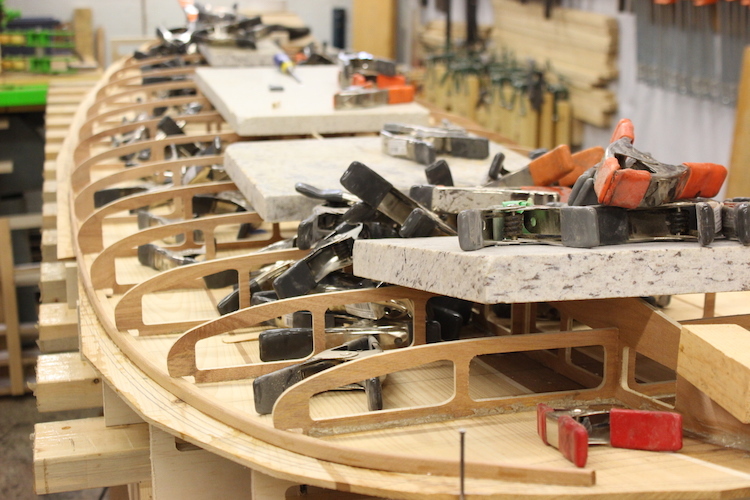 Building the cove & bead rails are the next step in building a hollow wood surfboard or paddleboard. The rail strips should be added 1 at a time until you get past the apex of the rail. Attaching the rest of the rail strips on your hollow wood board is only slightly harder than the Foundation Strip you have already done. 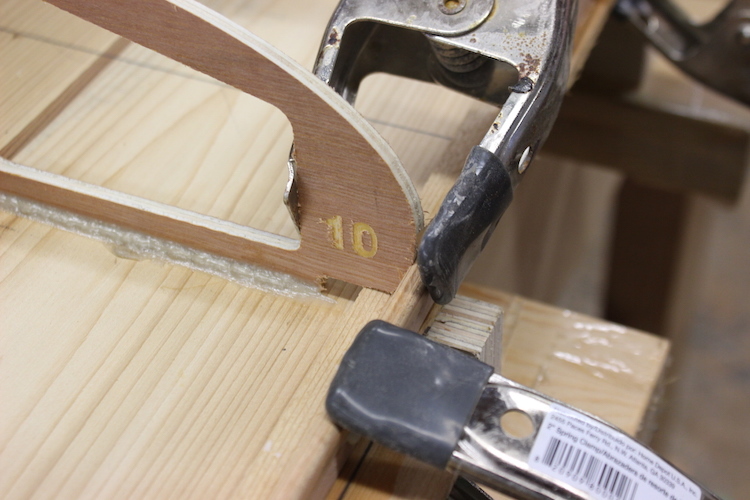 The added difficultly mainly comes from trying to apply clamps at the weird angles. This step-by-step tutorial will teach you a variety of clamping techniques utilizing both 2″ spring clamps a couple of homemade clamps. To start this tutorial your board should be looking something like this. Outline Strip and Foundation Strip in place and fully dried. The rest of the strips that are added will have both a bead and cove side. 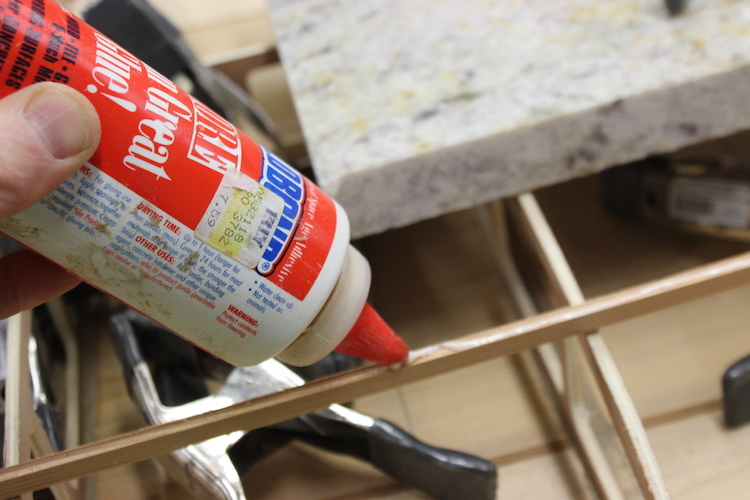 Before adding your very first bead & Cove strip you should check and remove any glue that has squeezed out on the inside of your Foundation Strip. 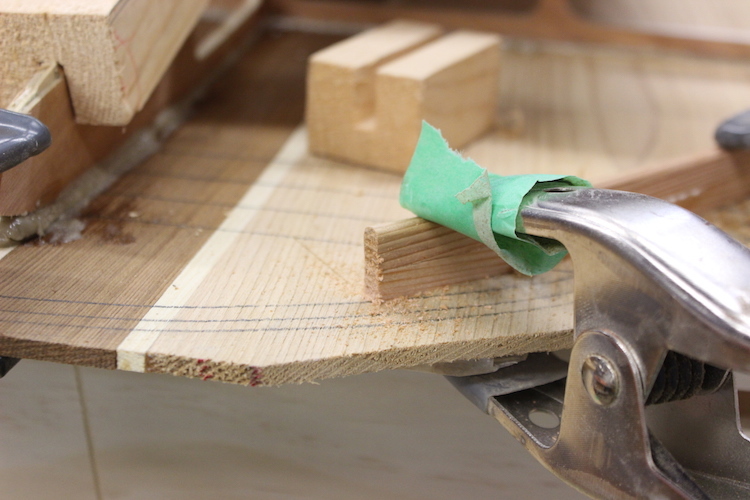 A chisel will quickly remove any hardened glue that might interfere with the inside cove edge. 3. The quickest and cleanest way to get glue on the rail strips is to turn the bead/cove strip upside down and apply the glue to the cove side. Lay the strip across the top of the ribs and use a 2″ spring clamp as a kickstand. 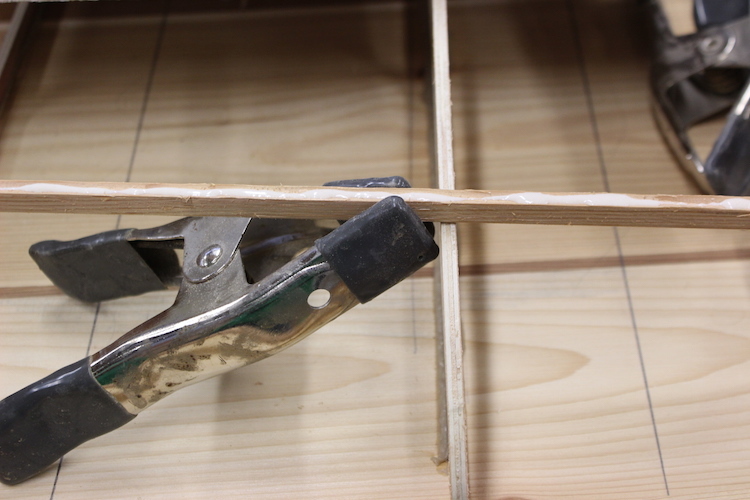 Use the finish nails at the nose and tail to control the strip and start clamping from the middle of the surf or paddle board towards the nose and tail. It is best to start clamping close to the ribs. 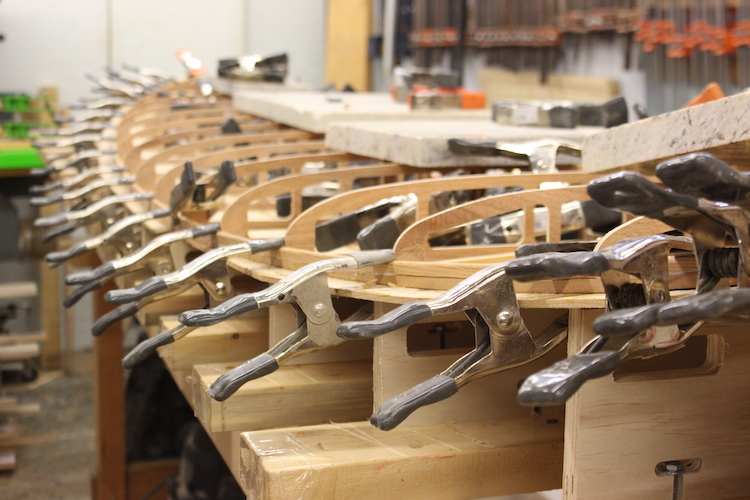 The spring clamps are easiest to position with 3 points of contact. 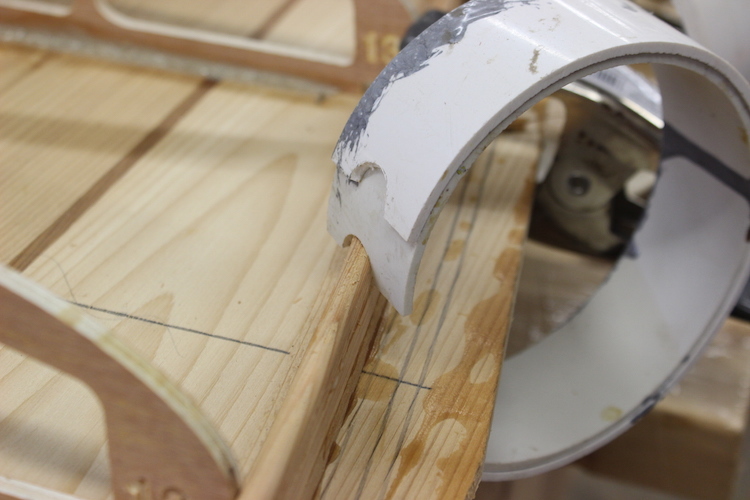 The rib is stabilizing the nose of this clamp preventing it from collapsing inward. The weight saving holes in Sliver Paddleboards CNC cut ribs are designed with a flat spots near the rails to allow the rails to be squeezed tightly against the ribs. 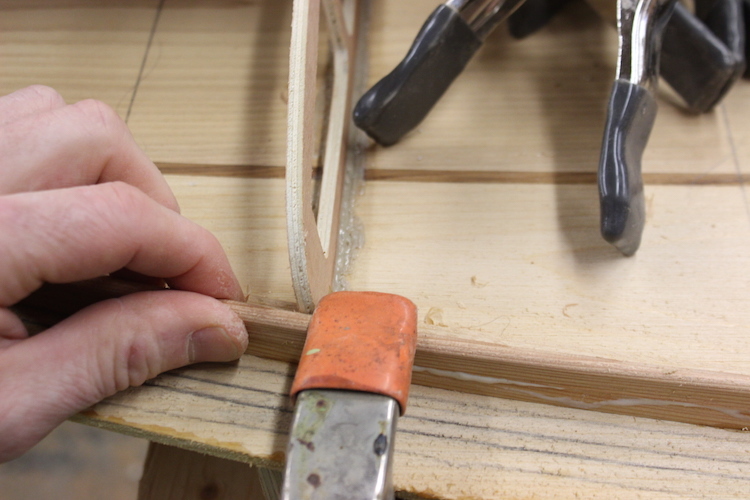 Start by adding 1 clamp to each section with the nose of the clamps touching or very near the ribs. If you try to add a too many clamps to 1 section all at once you increase the chance of your ribs blowing out or falling off the bead below. Here is a close-up of a 4″ drainage clamp in action. These clamps have many benefits starting with they are FREE. Every new house that is built throws out enough drainage pipe cut-offs to supply your hollow wood board building needs. The other benefits are these clamps excel at clamping at weird angles, reaching over spring clamps, as well as having the ability to stack clamps to adjust pressure as shown in this picture. As the rails get above the 2″ capacity of spring clamps switch to using mainly drainage clamps. 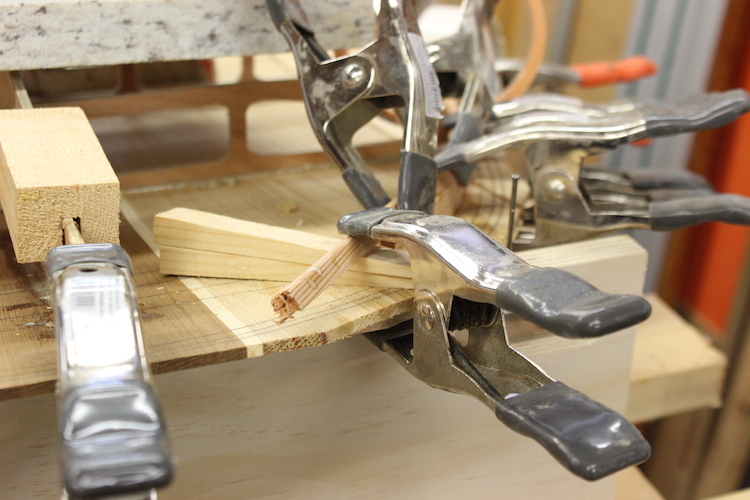 You can still use the spring clamps to laterally squeeze strips together. In the picture above, a drainage clamp was chosen, as the spring clamps would have had too much pressure and has to potential to blow out the rails. 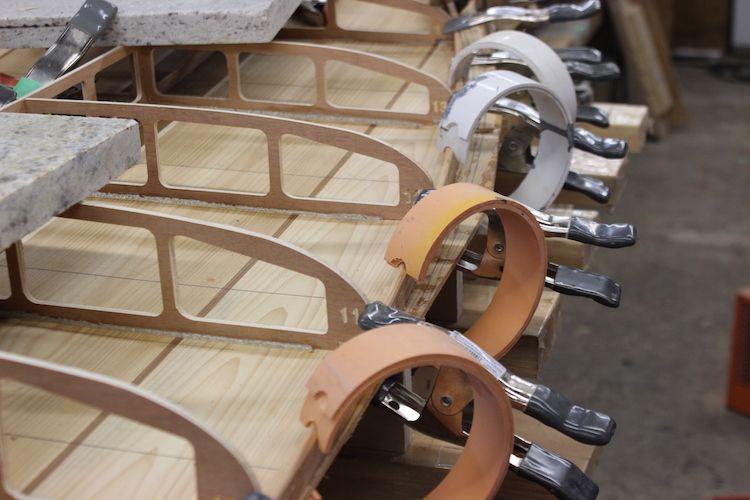 The first 3-5 strips are leaning outward forming the bottom of the finished rail. 5. As you approach the nose and tail you should add some steam for a couple of minutes. 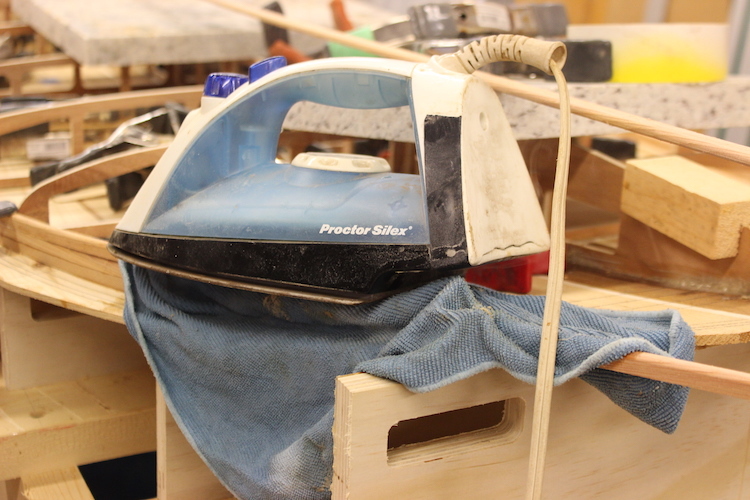 The bead/cove strips are thin enough to allow for the majority of the curves required with out steam but to achieve the correct shape and allow the rails for fold inward steam really helps. 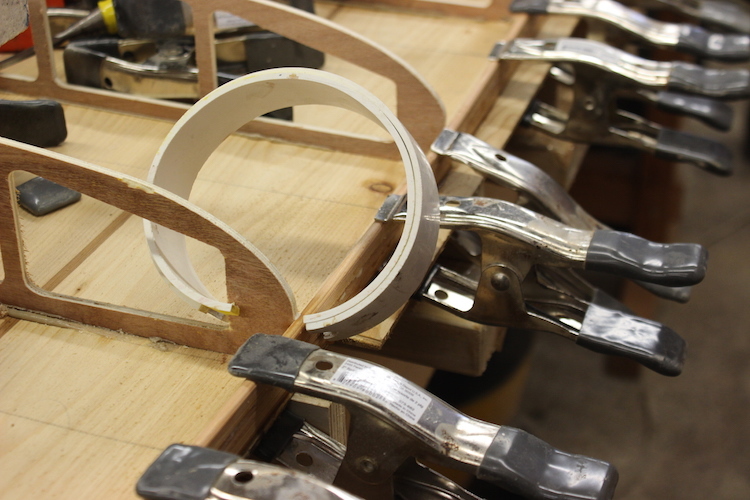 You can use wooden wedges to help set the correct amount of angle at the nose and tail. 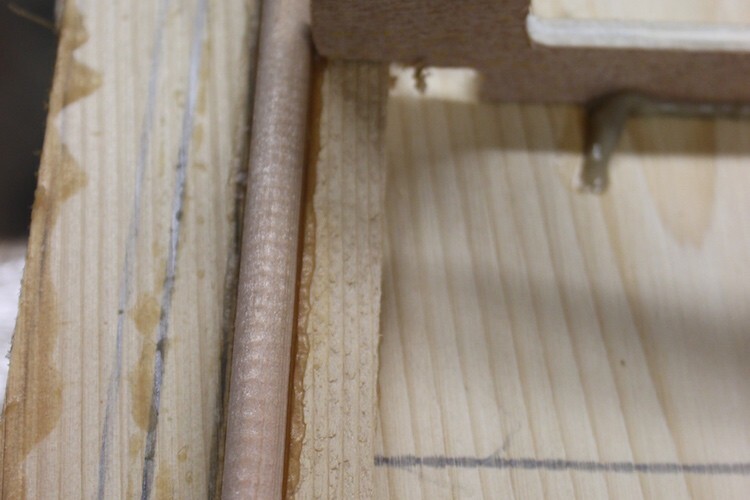 Without the wedges supporting the rail strip it will have a tendency to collapse inwards as the pressure is applied.